Whenever someone refers to me as an expert on prayer, I want to laugh out loud. Then I feel embarrassed for being such a hypocrite—after all, I did write a book about prayer. It’s not an illogical conclusion. Yet I’m not comfortable with that praise. Finally, I open my mouth to try to speak—and close it again without saying a thing. Eventually, I usually move forward as though I didn’t hear that comment after all. Because if there’s one thing I’m not, it’s an expert. I start to pray in the shower, often making it only as far as “Dear Lord…” before I’m distracted by the scent of the conditioner or notice that I need to scrub the tub. As I’m settling into work at my computer, I’ll think, oooh, I should write in my journal and pray. But then I decide I might as well finish this one thing first. By the time I do, I’ve forgotten I wanted to pray and moved on to the next thing on my to-do list. I see a Facebook prayer request from a friend, and type “Praying…” as I start to lift her up to God. “Lord, be with her. Help her to know…” and then my phone rings. As I hang up, my blood sugar level crashes and I reach for a quick snack. A glance at the clock tells me I’m late to pick up my son from school. I guess what I’m saying is that if you could see inside my mind, the speed at which my thoughts spin from one topic to the next might make you dizzy. But maybe that’s the point. Maybe that’s exactly why I’m the one who wrote a book on prayer. Because it’s okay not to be perfect. It’s okay to forget and be distracted and interrupted, to rely on the truth that God’s mercies are renewed daily. To start over again tomorrow. It’s all right to let God’s grace carry you. It’s normal to feel like you’re out of your element, in over your head. 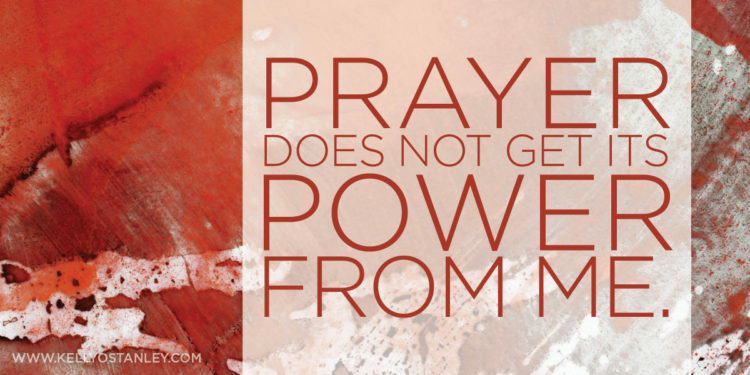 There is one expert fact I know, though: Prayer does not get its power from me. It comes from God. From the One who hears us. Who welcomes us. Who beckons us, daily, moment by moment, to turn back. To remember. To lose ourselves in Him instead of in the momentum of our overscheduled, too-full days. See, I fail over and over. I forget, I fall short, I hesitate, I don’t follow through. But even in the midst of my ineptitude, I’ve seen God. I’ve witnessed His unexpected, and perfectly timed, answers to prayer. I’ve seen Him respond to serious, fervent prayer—and to half-hearted, toss-it-toward-the-sky-before-moving-on prayers—in equal measures. I’ve stumbled through dense, fertile seasons of intense, passionate prayer, lush and beautiful months in which the words multiply and God’s presence is dripping in great drops of dew, magnifying and defining every moment. And I’ve walked through deserts of dry despair, where words evaporate in the heat even before I can form them, where I pant, my whole body screaming for just one drop of Him. Yet He’s been there through all of it. I can’t explain it, but I can bear witness to it. So maybe that’s why I wrote my book. To tell you these stories. To put out there, for the whole world to see, my bumbling, stumbling, inadequate efforts. To let you know that prayer isn’t about you. You can’t measure it or really define it. Nor can you do it alone. You just have to do it. It’s as simple as that. Because if you pray, if you so much as try, you will meet God. You will be changed. And if you keep your eyes open in the process, you will see Him. You will learn to believe that He can do all the things you long for Him to do. And you’ll discover that, unlike us, God never fails. He never has doubts, and He never forgets. He is the expert, the author, the authority. Our prayer is made perfect because the Perfect One is the one who receives it. This post originally appeared on the blog of Jennifer Dukes Lee.